PEAT’s solution for municipal solid waste is the Thermal Volume Reduction & Conversion™ (“TVRC”) technology – an innovative system that combines a thermal volume reduction system with its core PTDR plasma-arc plasma gasification system. Each TVRC system (modular) can process up to 250 tons per day of municipal solid waste (MSW) with no secondary pollution or unusable by-products generated: all feedstock represents a 100% waste diversion, eliminating the need for landfill disposal and/or further processing. It eliminates any future liabilities to the generators resulting from the use of outside collection, treatment and disposal services/facilities that are potentially unscrupulous. Further, a TVRC system generates high volume (over 8 to 1) and weight (over 4 to 1) reductions. In a TVRC, MSW is first thermally processed in a high temperature reactor/boiler to generate steam. This steam is then processed in a full condensing steam-turbine generator for electricity production. Any gas generated is processed through a flue gas cleaning system that removes any potentially harmful gases to surpass European emission standards. Any fly ash generated in the high temperature reactor/boiler is processed is the PTDR plasma-arc plasma gasification & vitrification system. The PTDR converts the ash into an inert, non-leachable vitrified matrix that can be used in a variety of commercial applications including concrete aggregate, insulation, roadbed/fill construction and even in decorative and non-decorative tiles. Independent laboratory tests (i.e. “TCLP”) have proven that the vitrified matrix does not leach, is totally benign and safe for any re-utilization. Any residual by-products generated in the gas cleaning systems (i.e. baghouse catches, scrubber residue, etc.) is collected and also processed in the PTDR system, thereby creating zero residual waste from the TVRC. 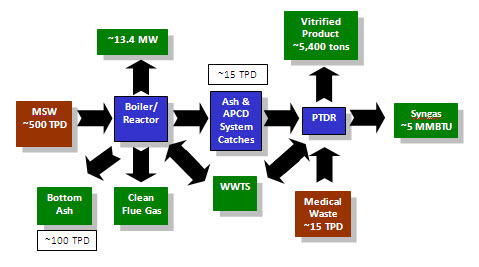 Plasma-Arc Gasification: Smaller Physical Footprint? There are a number of perceptions within the marketplace regarding plasma-arc treatment and plasma-arc gasification processes. Last week, this blog addressed its ability to process a wider range of feedstocks that other thermal treatment technologies. This week we look to address the claim/perception regarding a smaller physical footprint with regards to plasma-arc gasification waste-to-energy systems. Plasma-arc gasification reactors do not require moving grates and the smaller volume of gases generated means that the plasma-arc gasification reactors can accommodate the required minimum residence times in a smaller volume. Further, the smaller gas production and reducing environment within the plasma-arc gasification reactor does facilitate smaller sized air pollution control systems. However, due to existing scale of the plasma-arc gasification waste-to-energy technology, large scale application of the plasma-arc gasification process when dealing with municipal solid waste for example could require numerous process trains and thus potentially negate this advantage.